Store bought salsa is never as good as what you can make at home. 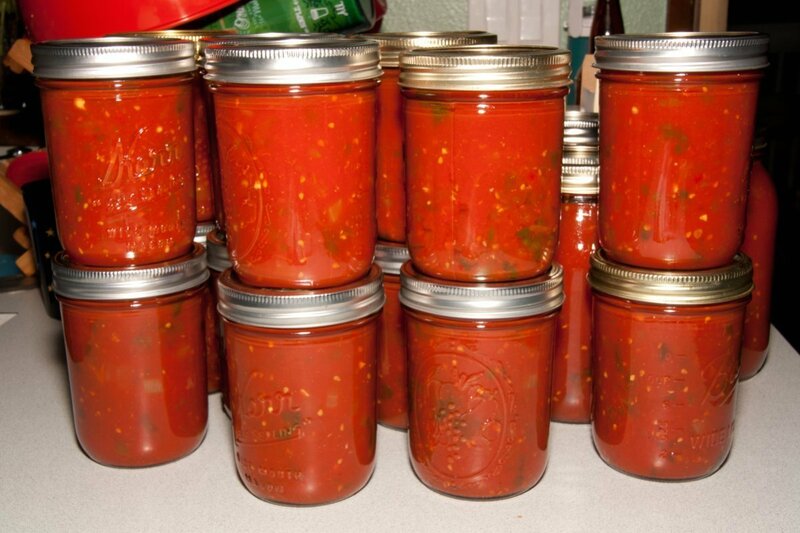 By making a large batch and canning your salsa, you can store jars for later or give them as gifts. This is a guide about canning tomato salsa. This is a family recipe from my friend Stephanie. The cooked salsa is similar to jarred supermarket salsa, like Pace. She used to make this years ago so we decided to have a Salsa Canning party and make 4 batches, for our families and gifts. I can already tell that we will need to make another batch soon. We got our tomatoes at the local Farmer's Market (Forty pounds of tomatoes is a lot!). I think the salsa cost us about $2.50 a quart, which is not a lot of savings if you are buying from the supermarket. 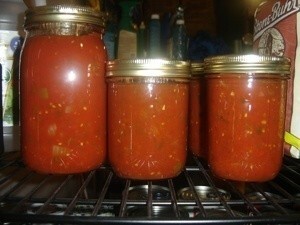 Tomatoes and canning jars (which are reusable) were the bulk of the cost. *I have found that 10 pounds of tomatoes is about half a paper or reusable grocery sack, or will fill up a plastic grocery bag. Figure 3 large or 6 small tomatoes per pound. To peel tomatoes, cut an "X" at one end and submerge them into boiling water for about 30 seconds. Then dunk them into a icewater bath and the skin will pull off easily. **Leave the veins and seeds in fresh jalapenos for spicy salsa. We seeded ours and it is very mild. Place all ingredients into large kettle. Simmer until desired thickness is reached, 45 minutes to an hour and a half. Check seasonings at end and adjust to your personal taste. Add the cilantro at this time, so that the fresh flavor will not be cooked away. Pour into sterile pint or quart canning jars. Leave about 1/4 inch headroom, to avoid problems in storage. Seal immediately with a hot water bath. This will yield approximately 5 quarts. The salsa should be good for up to a year, if it lasts that long. Wear rubber gloves when chopping fresh jalapeno peppers. If you have sensitive skin, you may want to also wear them for the onions and tomatoes. Have your canning jars sterilized and ready to be filled and sealed. Make sure you have a few more than you need, just in case. I think we got 11 pints per batch. You can get most of these spices on the Hispanic or Ethnic section of your grocery store. They will come in packages instead of bottles and are usually much cheaper. You can also buy spices in bulk many places. If you are trying to use your home grown tomatoes but are not getting 10 pounds at a time, peel and chop tomatoes as you harvest them and store them in the freezer until you gather enough. The freezing will soften the tomatoes but the cooking will do that anyhow so the resulting salsa should be about the same. Be sure to label your salsa with the date and version, especially if you can other things, like stewed tomatoes, soups or spaghetti sauce. Store it in sight, so you don't forget about it. Stephanie found several full jars that had been replaced in the canning jar boxes from years ago. In addition to just opening a jar to eat with chips, you can also use it as a base for chili or thicken it for an enchilada sauce. Once you have perfected your own recipe, it is just as easy to make a double batch. We had a festive Mexican dinner after all the cooking, with chips and salsa, of course! It would be a fun yearly event. We served grilled shrimp tacos and crockpot salsa chicken. We just put the chicken in the crockpot with some taco seasonings and a bit of water to cook. We added about a cup of salsa when we had that ready and it was succulent and tender. I got this tip from a neighbor. Instead of cooking my homemade salsa for canning on top of the stove, and having the tomatoes cook to a liquid, I put the mixture into my roasting pan and baked it in my oven for 4-5 hours, stirring every hour. I baked it at 350 degrees. The tomatoes stayed a little chunky, the sauce tasted and looked just like store bought, and didn't turn into a mushy mess. Can I can salsa without cooking it? Can I boil my jars and have them hot and pour my salsa in them? Will it keep? No. It will go sour. You can freeze it without boiling it but if you put it in jars you need to boil it in the jars. No! It would not be safe. Pour it into the sterilized jars then use a cold water bath canner to process. Get a canning cook book and process the time it says. Since tomatoes have so much acid in them you should not need to can under pressure. I've canned salsa before, it's been several years, but I distinctly remember using the canning instructions for canning tomatoes, which is basically what salsa is. I remember having good success, even though it didn't taste 'fresh' anymore. It was a good product. Find your local canning instructions, and follow that. Good luck! What are the benefits of canning salsa? How long does it generally stay good for? I would put it in freezer. It will last a long time, good luck. As far as cooking before hand or not, I think the tomatoes have to be cooked a bit to be canned. If you want fresh, you could freeze whole tomatoes and make up a quart or 2 as needed; yes the tomatoes were frozen but would probably make up satisfactorily. I canned salsa with my sis in law and it was so good, and so nice to have all winter. It didn't last long. The benefit of canning is: you have it when you need it, and provided you used the tomatoes when perfectly ripe [pick a lot, can as they ripen, ripen on cardboard under a sheet or old blanket] the flavor will be great, and the nutrition at it's peak. As for saving money, probably not much, but if you have canned foods and a large bill, you can buy the minimum groceries and take care of that bill that month. I made salsa this summer and just finished my last jar recently. I think that if you can it correctly, it should last for about a year. I wouldn't try to make it last longer than that. My friend found a bunch of jars of salsa in the boxes which she thought had empty canning jars. It was several years old. It looked and smelled fine but she emptied it all in the trash anyhow. Better safe than sorry. Here is my friend's salsa recipe that I posted on ThriftyFun. I may make another batch before summer if I can get my hands on a bunch of tomatoes. Yum! Canned salsa as stated if canned properly will last a year or more. One of the benefits is you can make it as spicy (or not) as you like. If canned and stored properly, home canned items will last for years. Home canned salsa doesn't have preservatives that store bought has, and you can season it to taste. I made salsa with canned tomatoes, everything else was fresh. I did not know you had to cook the salsa, do I have to cook it and pressure can it since I used canned tomatoes? I am totally lost here. My salsa is not chunky either, it is more like a paste, and tastes much better than store bought. Would I be better off freezing it or can I just hot water pack it? Salsas can be completely fresh, partially fresh and canned, cooked, canned, frozen, etc. If you plan to keep the salsa, you can freeze or can it or simply keep it in the fridge if you plan to use it soon. I have a great and easy recipe for black bean salsa using canned black beans, canned corn, and canned tomatoes. I make it using olive oil and fresh lime juice with fresh seasonings like onions, peppers, and cilantro. It is really lite and fresh and fantastic on tacos or grilled chicken salad. I usually make a big batch for parties,but never have any leftover. I would love to know if there is a way I can can this salsa without cooking it. I was hoping this could be done since I am using canned tomatoes instead of fresh. If you plan to keep your salsa recipe for future use, home canning and freezing are the only options. Storing it at room temperature without canning or freezing will result in spoiled food with the very great possibility of botulism. I have a recipe for fresh salsa. Can I seal it up in canning jars without cooking the tomatoes beforehand or does it have to be cooked? If you want the jar with fresh salsa with uncooked tomatoes in it, it must be refrigerated and will stay good for a few days. Sealing the jar will require heating the salsa (I simmer mine in a big pot on the stove for a hour to an hour and a half) and packing the hot salsa into a hot jar and placing a lid on it. This will seal the salsa and you will then be able to place this sealed jar on your pantry shelf. I think canning fresh salsa defeats the whole purpose of making fresh salsa. If I want cooked salsa, there are many good ones in the grocery store. Right now is tomato season and I am making fresh salsa by the gallon. We are enjoying all we can eat freshly made. I take leftovers each time I am ready to make a new batch, spoon it into ice cube trays and freeze. Empty each ice cube try into a sandwich size Ziplock. Expel as much air as possible and seal. Place as many packages as will fit into a gallon size Ziplock labeled "Fresh Salsa" and return to your freezer. You will be able to enjoy fresh salsa all winter. Just remove one small bag, empty into a container, thaw, and enjoy.